Above: L-R Nicole Hint of Mint, Sally Hansen Gray by Gray, Gilty Pleasure, Yellow Kitty, Fairy Teal, Midnight in NY, Vivid. 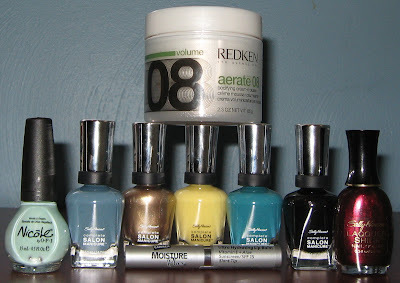 Also shown is Carmex Moisture Plus Hydrating Lip Balm and Redken's Aerate 08. 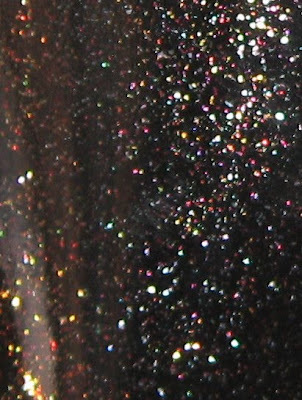 Below: Bottle close-up of Sally Hansen's Midnight in NY. It appears to be a black creme with multi-colored micro glitter. Not a terribly exciting week in hauls, but I'm hanging on to my $$$ so I can add to my Rescue Beauty Lounge polishes during their 50% off sale on 12/15! I've given up on my Walmart ever stocking the new Hard Candy line, but I did spot 2 new end caps that had a new Nicole by OPI collection and the new Sally Hansen Complete Salon Manicure polishes. I only picked up one of the Nicole's, but it looks like a good one, because it's a mint green shade with micro shimmer. The new Sally Hansen polishes, although pricey at $6.50, also had some trendy shades and you know Fairy Teal is the one that caught me eye first! I also picked up Vivid from their Lacquer Shine line for the simple fact that it looked like it was a glowy wine color with a black base. I walked away from it not once, but twice, before I finally realized I wouldn't be satisfied until I put it in the cart. The other two products I purchased are not nail-related, but I wanted to share them with you because they are beauty-related, and I'm impressed with them both. I was impressed enough with the Carmex Moisture Plus Ultra Hydrating Lip Balm that this is my second purchase. I bought my first tube in October and it's almost gone. I have tons of lip balm products and fear I have an addition to always having something on my lips. After using this product for a couple of days, I found I was applying it less and less during the day, leading me to believe that it must actually be hydrating my lips enough to make them feel moisturized for a longer period of time. It's a clear twist up stick that feels refreshing and slightly tingly or minty on the lips, but not nearly as intense as the original Carmex in the little pot. I picked this up at Walmart for $2.49. I'm a huge Redken product fan, and I was happy to have finally located their new Aerate 08 Bodyfying Cream-Mousse when I got my hair cut and colored this week. It's a very light cream that seems to have air pockets in it, somewhat like a mousse, but without any sticky or crunchy feeling to it once applied to damp hair. It leaves my hair soft and definitely much fuller. This retails for around $12-$14 for a 2.3 oz. jar, and I find that less is more with this, so I only use a small amount for big results. Are their any products you've been hunting for and recently found? Who's plotting their order for Rescue Beauty Lounge's sale? Oh nice! You got that Nicole at Wal Mart? That surprises me, I guess my Wal Mart is just chintzy. I'll look around. Will you post swatch of it please?! The Carmex product is excellent! I started using it about a month ago and love it. It's so dry here (Colorado) and this really works. I'd love to see what that new SH teal looks like, and the greyish blue one looks really interesting! Is it anything like Barielle's Slate of Affairs? I've been lemming for a color like that! Vivid is one of my favorite colors...I think i'm on my third bottle which is unheard of for me. You picked out some great stuff! I have seen the new SH display at Rite Aid a couple of weeks running, but hadn't picked any of these up yet! They have a lot of pretty colors. I was hoping to see a bogo on them, as I wasn't positive that I needed them. Haha. I've been thinking about some RBL, maybe since it's so close to my birthday, I should get a couple, but I am still not sure what I need to have first! What a neat Nicole color! I'm loving pastel colors lately, so addictive. I think you got some neat stuff! I'll be curious about the SH swatches. Oh! PS, my Walmart seems that they'll never get any Hard Candy either. :( Very strange, no? I am definitely planning on buying some RBL polishes. I just hope the site won't be hard to get on to. I have to check what I have. I have so many lip balms in every drawer in my apartment. I've never used Carmex. I certainly have seen it around. I'm using EOS lip balm. I really love this one. It also tastes good like a butter mint. I'm definately plotting a RBL order! I didn't order all the ones I wanted during the last sale so I'm going to stock up now. I guess I'm lucky as far as WM is concerned. Ours has the new SH, the Hard Candys and the new Nicoles. Last time I got my hair done they used the new Aerate mousse on it. I really liked it but usually when the stylist uses a product on my hair it doesn't work as well when I do it myself! I might have to pick some up.